I have taken a little break this week from lacy knitting and ‘rediscovered’ an ongoing patchwork project which I have been dipping in and out of for about eight or nine years! This started off in my head as a cushion but I actually love making these these carded hexagons (reminds me of my grandmother teaching me how), so it’s progressed to a sofa throw and is now to become a bed throw, though it will be a while before it is finished and that’s totally ok for me. I like organic crafts and a change is as good as a rest. It uses mostly fabric from my stash with a little added here and there. 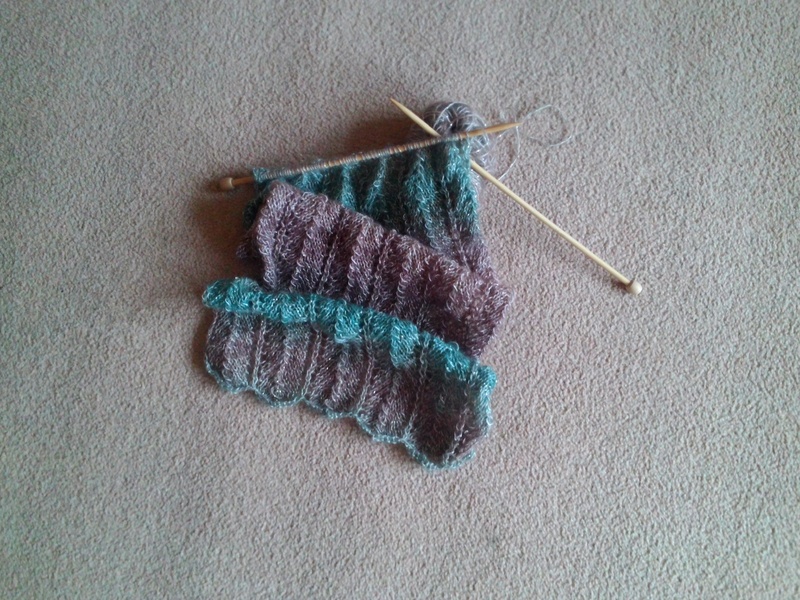 I am sure I will be back to knitting soon. Tacking card onto a few hexies! This is something I can easily do away from home, no fiddly sewing. A larger pile of hexagons starts to turn into four rounds of stitched together hexies. I visited a friend’s mother yesterday. She has been stitching for most of her 75 years. I envy her houseful of patchwork throws and cushions. She even has one that was her own mother’s. Maybe one day someone might envy my own houseful of handicrafts. Wouldn’t that be a wonderful thing? This entry was posted in Uncategorized and tagged knitting, fabric, patchwork, hexagon, stitching, Moda, handicraft. The Spring Knitting and Stitching Show at Olympia is about to begin. I have a trip there this Friday (aka tomorrow!). It promises a plethora of stalls and friends and I intend to browse and ooh and aah at what’s on offer, choose a few purchases carefully, not buy in excess but buy better. I have said this before, in different words, then come home with a lovely pile of yarn/fabric, awash with ideas and then spent a long time admiring my ‘pile’ before diving in or indeed ‘rediscovering’ that same untouched pile months later. I have realised I sometimes haven’t chosen enough of something for a particular project, or have been taken in by bargains or opted for a print that I wouldn’t usually go for as it doesn’t suit me or my home. Today I hope to make plans for what I might actually need or use. Theories are just great! We aren’t attending any workshops this time but it will be on the agenda for another visit. We were tempted by macrame – that’s one thing never tried but I have memories of my Mum and her Girl Guides making pot holders. I have just been given a lovely macrame book I shall give it a whirl at home one day soon. Whoever knew macrame might come back into fashion?! Take a look on the High Street (if you still have one). There is macrame and crochet everywhere! Show and tell next time. This entry was posted in Uncategorized and tagged kateholliday. I am still using up my yarn stash making hats BUT at least I am thinking about those other projects and can feel one particular one calling out to be finished. I shall reveal all here over time! Today it’s another Adriafil yarn called Attimo. It’s lovely to work with apart from the fluff shedding over me and the carpet. I used to work in a yarn shop that sold Adriafil about six years ago. The Italian rep used to come in and he was so dapper in his sharp suit and his after shave smelt divine! It didn’t take much to make us girls swoon then! I added Attimo to my stash when it was sold off at end of season. This is leftover from previous projects again. These hats are going to make heads very warm and toasty. This entry was posted in Uncategorized and tagged Adriafil, Attimo, fluff, stash.